Poker is one of the easiest gambling card games to learn. The whole game is about matching up different combinations of cards to beat other players hands. As poker is played with one 52-card deck, there are a limited number of variations you can have. It's easy to learn the different types of hands. 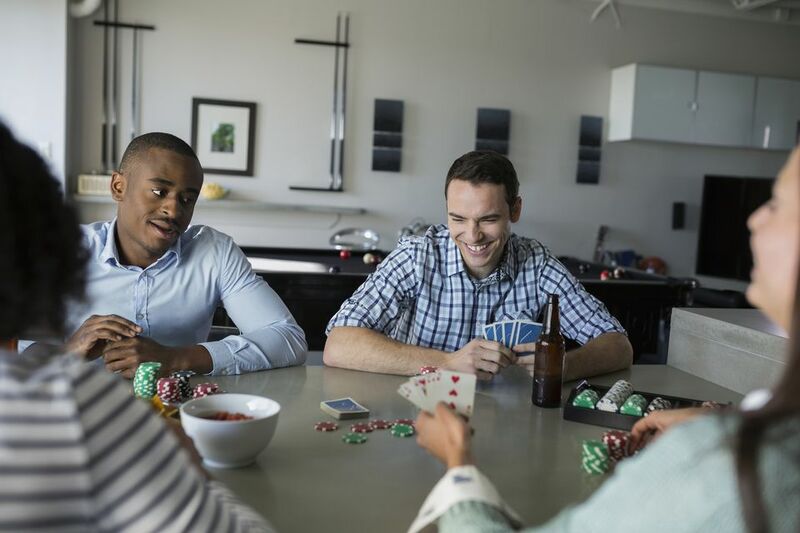 Once you learn the lingo, it'll be easy to feel like a high roller when you sit down to play. Standard five-card Poker hands are ranked here in order of strength, from the strongest Poker hand to the weakest. The is the best possible hand you can get in standard five-card Poker is called a royal flush. This hand consists of an: ace, king, queen, jack and 10, all of the same suit. If you have a royal flush, you'll want to bet higher because this is a hard hand to beat. Any five-card sequence in the same suit (e.g., 8, 9, 10, Jack and Queen of clubs; or 2, 3, 4, 5 and 6 of diamonds). If another player has a flush, they can beat yours if their cards are a higher number than yours. All four cards of the same value (e.g., 8, 8, 8, 8; or Queen, Queen, Queen, Queen) is known as a four of a kind. It's hard to draw a four of a kind which makes it a very good hand. Three of a kind combined with a pair (e.g., 10, 10, 10 with 6, 6; or King, King, King with 5, 5) is called a full house. Any five cards of the same suit, but not in sequence (e.g., 4, 5, 7, 10 and King of spades) are referred to as a flush. Five cards in sequence, but not in the same suit (e.g., 7 of clubs, 8 of clubs, 9 of diamonds, 10 of spades and Jack of diamonds) is known as a straight. Three cards of the same value (e.g., 3, 3, 3; or Jack, Jack, Jack). While this is a lower ranking hand, it's more commonly pulled than flushes or full houses. When you're betting, it's good to remember what hands are most the most common. Naming conventions in poker are pretty easy, for example, two separate pairs (e.g., 2, 2, Queen, Queen) is known as a two pair. Two cards of the same value are known as a pair (e.g., 7, 7). Whether you're playing for real money or not, poker is by nature a game of gambling. With each hand, you must decide if you're going to bet or not. You can fold at any point before being told to show your cards. If you fold, you lose any chance of winning the pot. After each player is dealt their cards, then the bluffing begins. Other players will be studying your body language trying to figure out your hand. It's up to you to decide what emotions you want to portray. A good poker player knows how to hide her true feelings about her hand. If you have a weaker hand, it might be a good idea to act overconfident and cocky in an attempt to get the other players to fold. If your hand is strong, you could act nervous in the hopes that the other players will bet more to increase your potential winnings. This kind of behavior is called bluffing and it's a fun part of poker games.